Here at our Corpus Christi law firm (serving all of Texas with our multiple locations), we always tell clients who come to us after a car accident not to sign anything or make any statements claiming they do not have any injuries. This is mostly because if you seek out a car accident lawyer to help you gain compensation for your troubles, you might have injuries that you are not yet aware if. If you suffer broken bones or lacerations, you have obviously been injured. But what about injuries that you cannot see or are not even aware of? 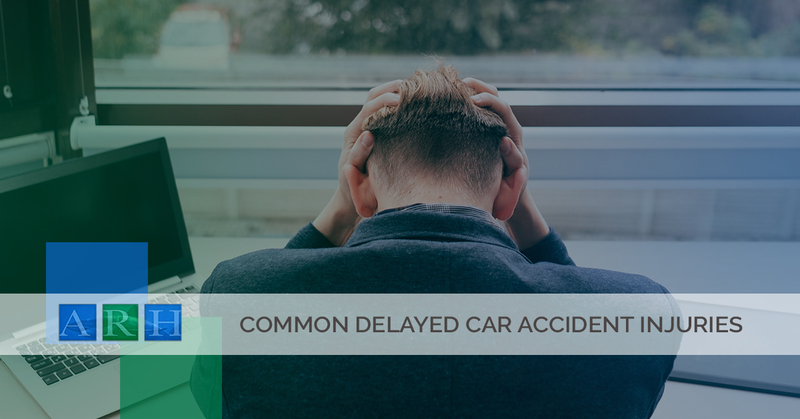 In today’s blog, we will discuss some of the most common delayed injuries — injuries that you cannot see or possibly even feel for weeks after an accident. Headaches can be caused by a number of injuries sustained in a crash and can sometimes take weeks or longer to appear. Some injuries that can result in delayed headaches include concussions, whiplash or neck injuries, bleeding or swelling of the brain, or blood clots. Another cause of headaches after a car crash can be a traumatic brain injury. This type of injury occurs when the force of an accident causes your brain to impact the hard interior of your skull causing tissue damage, bruising, bleeding, or swelling. A traumatic brain injury is sometimes not apparent yet can quickly turn life-threatening. Signs of a traumatic brain injury include headaches, dizziness, vision problems, weakness on one or both sides of the body, and other symptoms. Most often, though, a headache is the first sign that something is wrong so seek medical attention even if you think it is unrelated. This type of pain can result from your body being thrown about or twisting in an unusual way during an accident. Whiplash is a specific form of neck injury that results from your head rapidly jerking forward and backward or side to side and can occur in the most minor of accidents. Any back, neck, or even shoulder pain can be the result of a herniated disc, pinched nerve, spinal cord injury, ligament injury, sprain, or soft tissue injury. Often related to spinal injuries, numbness or tingling of limbs or other areas of your body can be the result of a pinched nerve or herniated disc. It can also be a sign of internal bleeding or a brain injury. It is important to pay attention to your body after an accident and seek medical attention for any tingling or numbness. Internal bleeding occurs when there is a lot of force applied to the body which causes damage to the internal organs. Even though the blood is inside of you still, your body is still reacting like you are losing blood which can result in emergency surgery and blood transfusions. Signs of internal bleeding include dizziness, weakness, visual problems, numbness, shortness of breath, and nausea, among other symptoms. Internal bleeding can be minor or severe, which is why it is important to be under medical care after an accident. Stomach pain after a car crash is often the result of internal bleeding or organ damage, sometimes caused by the impact of the airbag or seatbelt along your abdomen. Emotional trauma might not seem as severe as internal bleeding or a brain injury, but it can negatively impact your life and require medical treatment all the same. Some people experience post-traumatic stress disorder (PTSD) after a car accident whether it is a minor accident or a severe one. Other emotional issues that may arise after a car accident include trouble sleeping, mood swings, trouble focusing, panic attacks, nightmares, depression, and personality changes, among others. While you can’t see emotional trauma, it can impact your quality of life, relationships, and ability to function. All of this deserves compensation if it has been the result of a negligent driver. Experiencing Delayed Injuries After A Car Accident? Call Us! If you are experiencing any of the above symptoms or injuries that were not discussed above as the result of a car accident, you might be eligible for compensation for both physical and emotional trauma. Get in touch with Alex R. Hernandez Jr. PLLC today to get started. Our team of legal experts can connect you with a car accident lawyer at our firm who can fight on your behalf to get you the compensation you deserve. Though we are based out of Corpus Christi, we have law offices throughout Texas including in Houston, San Antonio, Dallas, Laredo, and Austin, to name a few. Our team has experience handling car accident injury cases and can use their background and skills to attempt to secure the best possible outcome for you. Get in touch today!